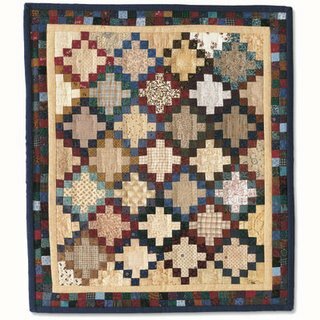 Country Acres15 1⁄8" x 17 1⁄4"
by Lola Hendrickson, Apple Valley, Minnesota Based on Cabin Cozy Flannel from Fons & Porter's Love of Quilting magazine, issue date: January/February 2004. One tidbit of advice was to look at completed quilts. So I wandered over to Fons & Porters website & saw this little gem. It made me smile, becasue I have this full size quilt as a UFO. (The photo shows a mini-from a challenge that the magazine hosted.) Mine will be similar - super scrappy, but my darks are Oriental prints and my backgrounds will be creams, taupes, whites - not shirtings and light prints as shown. Also while visiting their website, I found this pattern which you can use to showcase 1 novelty print or a collection of them (this pattern can make an otherwise unrelated pile of dog fabrics - you know Mumm Prints and Bright prints and realistic prints - come together beautifully.) I am also including it here because the sample quilt is SOOO ME (brights, black & whites, & cats.....) Or should that be "SEW ME"! The best part, it's a free pattern, so enjoy it & feel free to use it. Thanks so much for the pattern. As you know, I collect dog fabric like you and Nancy collect cat fabric ... liberally and indiscriminately! :) Lately I have been collecting poodles in particular for a raffle quilt for poodle rescue and this quilt might just be the ticket for putting them all together! I gotta say, cleaning the space is the best motivator I know! So much easier to sit down and work if it's not total chaos, at least, for me... Also, I've been trying to finish 1 UFO for every new thing I start, and wanting to get to the new things really has me working those UFOs. Good luck! finding a quilt finished that you are part way through can be inspiring-mostly you just have to sit down and "make" yourself get going sometimes to work through a slump. I remembered this pattern once I looked at it-nice and fast! WOW...this Lola person...from AV MN...did she design this pattern? I've never heard of her and I lived in Apple Valley over 10 years until we moved here 4 yrs ago!!! Very cool! 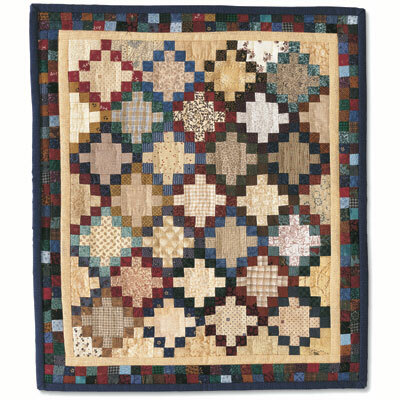 Cute quilt and great design for showcasing a collection. Thanks! Thanks for sharing - I am in the process of re-cleaning up my space. I work much better without the clutter, and I can find stuff quicker when it's more organized too. Thanks for sharing both the quilts! What a great quilt - thanks for posting the link to the pattern. I make a lot of charity quilts and this pattern makes a very cute quilt.